Quality Control - KLKJ Group Co.,Ltd. Tested , finish quality looks great! We will order more in the near future. we are intending to think over a long-term solution in cooperation with KLKJ is without doubt . Each process is meticulous under strictly full test analysis to ensure every parts in stictly quality control standard. All spindles are in stringent quality control procedures to ensures every spindle passes the all key points of specification to meet standard requirement , and meet special requirement from customer. 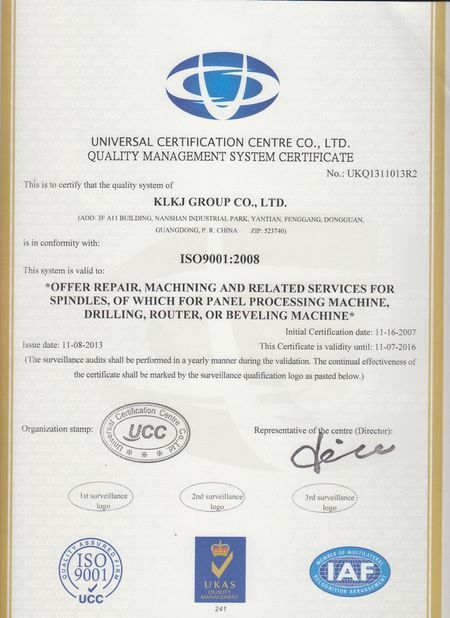 Issued By:UNIVERSAL CERTIFICATION CENTRE CO.,LTD. China Good Quality CNC High Speed Spindle Supplier. Copyright © 2014 - 2019 cnchighspeedspindle.com. All Rights Reserved.